Mount Agung or Gunung Agung (Balinese: ᬕᬸᬦᬸᬂ ᬆᬕᬸᬂ) is a volcano in Bali, Indonesia, southeast of Mt Batur volcano, also in Bali. Gunung Agung stratovolcano is the highest point on Bali. It dominates the surrounding area, influencing the climate, especially rainfall patterns. From a distance, the mountain appears to be perfectly conical. From the peak of the mountain, it is possible to see the peak of Mt Rinjani on the nearby island of Lombok, to the east, although both mountains are frequently covered in clouds. Gunung Agung is an active volcano, with a large and deep crater that occasionally emits smoke and ash. Having begun in 2017, this volcano's latest eruption is ongoing as of 2019. "After having been dormant for a long time, this year the mountain began to be alive again. In the first days of the activity earthquake shocks were felt after which followed the emission of ash, sand and stones." The eruption of 1963 was one of the largest and most devastating eruptions in Indonesia's history. On February 18, 1963, local residents heard loud explosions and saw clouds rising from the crater of Mount Agung. On February 24, lava began flowing down the northern slope of the mountain, eventually traveling 7 km in the next 20 days. On March 17, the volcano erupted (VEI 5), sending debris 8 to 10 km into the air and generating massive pyroclastic flows. These flows devastated numerous villages, killing an estimated 1,100–1,500 people. Cold lahars caused by heavy rainfall after the eruption killed an additional 200. A second eruption on May 16 led to pyroclastic flows that killed another 200 inhabitants. Minor eruptions and flows followed and lasted almost a year. In late September, as a result of the increased rumbling and seismic activity around the volcano, the alert level was raised to the highest level and about 122,500 people were evacuated from their houses around the volcano. The Indonesian National Disaster Management Authority declared a 12-kilometre exclusion zone around the volcano on 24 September. Evacuees gathered in sports halls and other community buildings around Klungkung, Karangasem, Buleleng, and other areas. The monitoring station is located in Tembuku, Rendang, Karangasem Regency, from which the intensity and frequency of tremors were closely monitored for signs of imminent eruption. By late October 2017, the activity of the volcano decreased significantly, leading to lowering of the highest status of emergency on 29 October. Early on Saturday 25 November a magmatic eruption began. The resulting eruption plume was reported to rise about 1.5–4 km above the summit crater, drifting towards the south and dusting the surroundings with thin layer of dark ash, leading some airlines to cancel flights bound for Australia and New Zealand. An orange glow was later observed around the crater at night, suggesting that fresh magma had indeed reached the surface. On 23:37, 26 November 2017 (GMT), another eruption occurred, the second in less than a week. Ngurah Rai International Airport was closed 26 November 2017, leaving many tourists stranded. Lahars were reported in the Selat district south of the volcano. More than 100,000 people in a 10 km (6 mi) radius of the volcano were ordered to evacuate. Australia's Bureau of Meteorology reported on 27 November that ash from the eruption had been observed at an altitude of 9,144 m.
In the beginning of December, the eruption powered down to minor emissions of steam and smoke. There were no reports of new volcanic ash on ground. Flights were suspended for about three days, and were resumed by 4 December. On 12 December a picture of the crater was taken showing a steadily growing lava dome occupying approximately one third of the crater. Three scenarios are possible: 1. Eruption stops as no more gas is available to bring more lava to surface. 2. Lava dome continues to grow slowly, bringing no explosive eruptions. In this scenario the main danger would be if the summit crater fills up, as the dome could collapse producing massive pyroclastic flows. 3. The lava dome forms a crust with gasses collecting underneath, until a critical pressure build-up would lead to a violent plinian eruption. 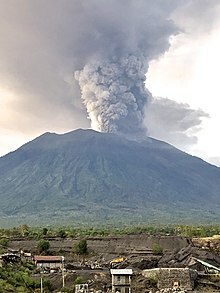 Agung remained on the boil until late June 2018 when it again erupted with 2 km high plumes interrupting air traffic. This indicated that magma continued to be forced up to the summit. On 3 July a Strombolian explosion occurred, sending debris in all directions. This indicated that a lava dome had exploded the crust away, the magma being gaseous enough to ensure the top of the dome exploded away avoiding splitting the side of the dome and spewing the entire contents of the dome down the side of the mountain. Balinese people[clarification needed] believe that Mt Agung is a replica of Mt Meru, the central axis of the universe. The most important temple on Bali, Pura Besakih, is located high on the slopes of Gunung Agung. Wikimedia Commons has media related to Mount Agung. ^ a b c "Mountains of the Indonesian Archipelago". Peaklist.org. Retrieved 27 November 2017. ^ "Gunung Agung, Indonesia". Peakbagger.com. Retrieved 27 November 2017. ^ a b "Agung". Global Volcanism Program. Smithsonian Institution. Retrieved 2018-06-29. ^ Anwari Dilmy (October 1965). "Pioneer Plants Found One Year After the 1963 Eruption of Agung in Bali" (PDF). Pacific Science, Vol. XIX. Retrieved 27 November 2017. ^ John Seach. "Agung Volcano". Volcano Live. Retrieved 27 November 2017. ^ "Geology of Mt. Agung". Pusat Vulkanologi & Mitigasi Bencana Geologi — VSI. Archived from the original on 2008-03-27. Retrieved 2010-11-20. ^ a b Pichayada Promchertchoo (3 October 2017). "Once tremors detected, Bali volcano can erupt within hours: Volcanologist". CNA. Retrieved 27 November 2017. ^ Lamb, Kate (2017-09-26). "Bali volcano eruption could be hours away after unprecedented seismic activity". The Guardian. ISSN 0261-3077. Retrieved 2017-09-26. ^ "Indonesian official: More than 120,000 flee Bali volcano". Fox News. 28 September 2017. ^ "Thousands evacuated as Bali volcano sparks fear". The Australian. 24 September 2017. ^ "Mount Agung: facts about Bali's imminent volcano eruption". UbudHood. September 23, 2017. Retrieved November 1, 2017. ^ "How do experts know Mount Agung is about to erupt?". ABC News Australia. September 25, 2017. Retrieved November 1, 2017. ^ "Volcano Observatory Notice For Aviation: Agung 20171121/0939Z". MAGMA Indonesia. Retrieved 27 November 2017. ^ "Bali's Mount Agung volcano erupts". BBC News. 2017-11-21. Retrieved 2017-11-21. ^ a b "Gunung Agung volcano (Bali, Indonesia): eruption has begun". Volcano Discovery. 2017-11-25. Retrieved 2017-11-26. ^ "'Get out now' 100,000 people told as Bali volcano continues to spew ash". Metro. 2017-11-27. Retrieved 2017-11-27. ^ Saifulbahri Ismail (27 Nov 2017). "Mount Agung eruption: Bali airport closed, flights cancelled". CNA. Retrieved 27 November 2017. ^ "Locals Watch As Lahars From Mount Agung Sweep Away Rice Fields". VIVA Indonesia (in Indonesian). 2017-11-27. Retrieved 2017-11-27. ^ "Mount Agung: Bali volcano alert raised to highest level". BBC News Online. Retrieved 27 November 2017. ^ "Volcanic ash update for Mount Agung". Australian Government Bureau of Meteorology. 2017-11-27. Retrieved 2017-11-27. ^ "Awas Gunung Agung, Status Dinaikkan Dari SIAGA Ke AWAS" (in Indonesian). Badan Nasional Penanggulangan Bencana (BNPB – National Disaster Management Authority). 27 November 2017. Retrieved 5 December 2017. ^ "700 flee 'thunderous' explosions and lava as Mount Agung erupts again". ABC News. ABC News. 3 July 2018. Retrieved 6 September 2018. Pringle, Robert (2004). A Short History of Bali: Indonesia's Hindu Realm. Short History of Asia Series. Allen & Unwin. ISBN 1865088633.